The Alicante region may be famous for its beaches and golf resorts but there is much more to the region than that. 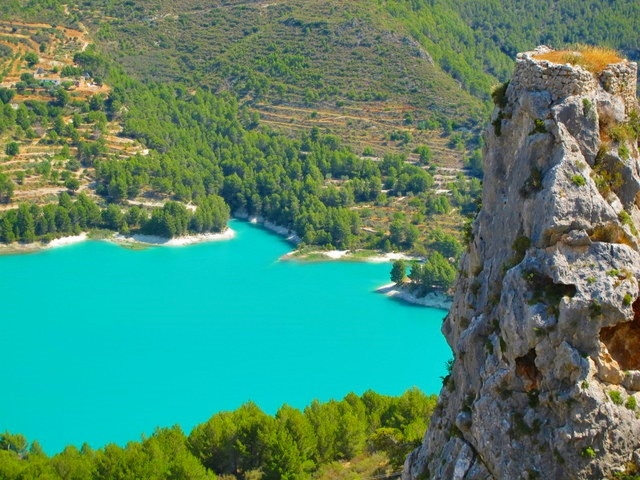 No visit would be complete without a day trip into the mountains and Guadalest is the perfect place. The winding road up to Guadalest takes you through some stunning scenery with breathtaking views. Once you reach Guadalest, you will feel as though you are a million miles away from the busy coastal resorts, although it is just 25kms from Benidorm. This picturesque mountain town is a tourist honeypot with many shops selling souvenirs and local produce, like olive oil, pottery and leather goods. The little cobbled streets and squares close to San Jose gate are where most of the shops, museums and restaurants can be found. Many of the restaurants serve serving regional cuisine, such as rabbit in garlic, stuffed peppers, many rice dishes or sausages. 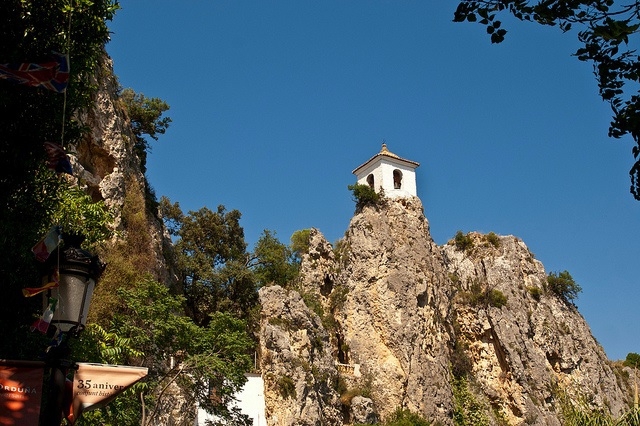 Guadalest is also home to nine museums, including a vintage car museum, medieval torture museum and miniatures museum. On the way back from Guadalest, make sure you have enough time to visit the Fonts d'Algar, which is a natural park of waterfalls and pools. It is simply stunning and is a perfect way to cool off on a hot, summer day. The 11th century castles hanging over the edge of the mountain were built to protect the area and as a lookout for potential invaders. Not much of the castles remain but you can visit the iconic restored tower. This is a fun trip for the entire family – although you'll need a head for heights and some sturdy footwear as some areas are quite steep. The dungeon is a fascinating place to explore and you will be rewarded with some fantastic views across the mountains and valleys to the Mediterranean beyond. The church is within the old walled city with a lovely traditional Spanish square outside. It was built in Baroque style in the 18th century. During the Spanish Civil War, the church was burnt and looted. Since then, some alterations and restoration work have been carried out. This is a beautiful collection of motorbikes from the 1920s to the 1970s. There are about 100 bikes in perfect condition. The Vespas will take you back to the days when the Mods and Rockers cruised the streets. The local cuisine is different to that found on the coast with plenty of meat stews or local sausages. As you drive towards the Algar fountains, many restaurants will offer parking if you have a meal. Otherwise head past the Algar fountains entrance to a campsite which has plenty of cheap parking. There is also a dinosaur theme park at Algar by the campsite.called DinoPark Algar. 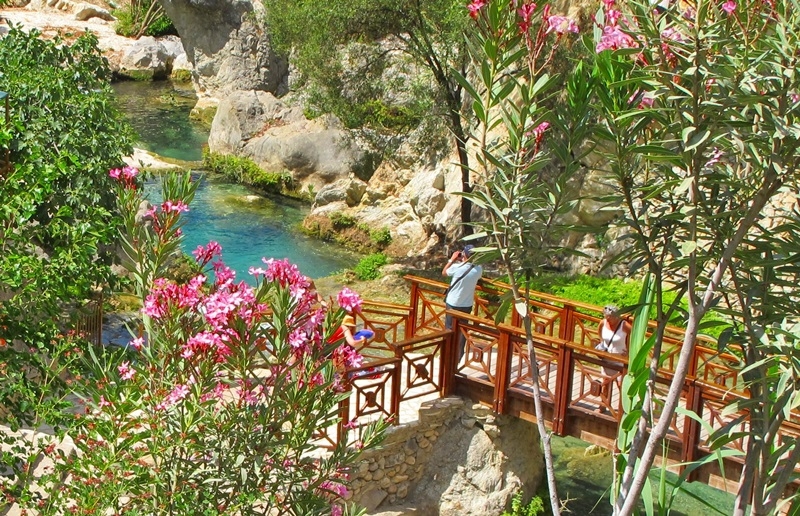 The Algar waterfalls are beautiful and the water is icy cold so be prepared if you go in for a dip! These are two beautiful areas of natural beauty, so don't forget your camera.